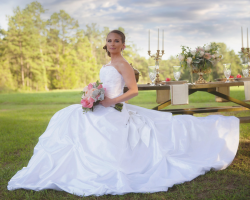 Operating on a basis of strong family values, Houston Bridal Gallery has been able to grow into a salon that provides a great deal of choice without losing the personal touch. They have also developed their store to enable brides-to-be to bring everyone in their wedding party along. Whether you need bridesmaid dresses, dresses for your mother or all of the accessories that come with a beautiful gown, their expert advisors will be able to assist you. Houston Bridal Gallery does everything to allow you to enjoy finding your dream dress. When searching through Houston wedding dresses it becomes clear that if you want a modern or particularly beautiful wedding gown it will come with an enormous price tag. That is why Esila Bridal has become the best gown rental store in Texas. Their goal is to provide each client with something that will take their breath away. By renting a dress you will be able to spend your budget on more extravagance on your wedding day rather than on a dress you will only wear once. With dresses this amazing you wouldn’t need to buy anyway. 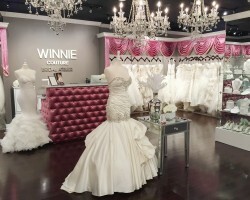 Winnie Couture Flagship Salon in Houston has been crafting some of the most sought after designer wedding gowns in the nation. Celebrity designer Winnie Chlomin Lee has also invested to insure a once in a lifetime shopping experience for all brides-to-be. As you enter bridal heaven, you will be treated to a glass of Champaign and taken on a tour of seamlessly crafted gowns. Visit Winnie Couture today to view their selection of Swarovski crystal accessories, and find the gown you have always wanted to wear on your wedding day.